Larry Ridley, bass; Billy Higgins, drums. When I reviewed his next-to-last album, No Room For Squares in the August 27, 1964 Down Beat, I wrote: "Hank Mobley has long been my choice as recipient of that overused word, underrated. Fellow musicians have realized his worth for a number of years, but others seemed oblivious to his talent. A trio of albums for Blue Note (Soul Station, Roll Call, and Workout) should have remedied this, but the did not get the recognition due them, perhaps because they were not radical statements of the avant garde." It is ironic that when a man spends years developing his craft to the point where he is a completely mature artist, musicians who could not meet the demands of an intricate music are garnering the publicity by making strange sounds on their instruments in the name of "freedom." In the No Room For Squares review, another point I made was that, "Mobley, who came first from Charlie Parker, absorbed from Sonny Rollins and John Coltrane at different points in his career but long ago developed his own sound and style." I also mentioned the "heated, connective flow of his attack and the tensile muscularity of his sound." That same kind of strength is evident inthe playing of Lee Morgan. For all its puissance, his style, like Mobley's, is never harsh or ugly. Its brilliant, brassy bite is in the tradition of the best of jazz trumpeting. Lee's recording of The Sidewinder heralded a reawakening in a career that had begun at the age of 18 in Dizzy Gillespie's 1956 band. Morgan, the young veteran who, like Mobley played prominently with Art Blakey's Jazz Messengers (for the most part they were in different editions although there was one unit that found them together in the front line), reaffirms here the high caliber of his recent work. Harold Mabern, Jr. is a vigorous pianist with a two-handed attack that gets very bluesy but in a very personal way. Even when "funky" jazz was at the height of its vogue in the early sixties, Mabern had his own thing going and never got into the self-conscious rut that many pianists did. First heard with the MJT out of Chicago, he moved to New York and has since been part of both The Jazztet and J.J. Johnson's group, among others. Larry Ridley and Bill Higgins are not featured in solo here--Higgins does get into some exchanges with the horns on "The Break Through"--but both contribute greatly to the cohesiveness of the date. In fact, this quintet sounds more like a working group, in terms of being "together," than many units that are operating on a regular basis. Ridley's wide range of experience in the last few years, including a stay with Roy Haynes' quartet, has made him a seasoned performer; and Higgins is merely one of the very best drummers in jazz. With Mabern, they give the horns support of a most sympathetic stripe. 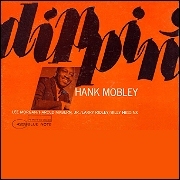 Dippin' begins, appropriately with "The Dip," Mobley's contemporary version of what Jelly Roll Morton once called the "Spanish tinge." Although 12-bar constructions are employed, this is not a conventional blues design, and when the soloists commence the rhythm does not revert to 4/4 either. Mobley, Morgan and Mabern all make good use of the rhythmic thrust in their improvisations as Higgins rolls and boils underneath. "Recado Bossa Nova" by Djalma Ferreira might be termed the "Brazilian tinge" for it was from that Latin American neighbor that we imported this "new wrinkle" a few years ago. Tenorman Zoot Sims first did this particular bossa nova in the midst of this form's great popularity. Although the fad has ended, bossa nova has taken its place in the scheme of American music and is still very enjoyable, especially when it is swung like Hank and Lee swing it here. This is not "pure" bossa nova but rather a marvelous combination of the best in North and South American music. "The Break Through," by Hank, is an unabashed, straight-ahead cooker with its roots planted firmly in bop. As in most Mobley compositions, there are interesting harmonic twists and turns, and the writer-leader makes good use of them. After Morgan's short solo, Mabern alternates a single-line with his two-fisted style before Higgins and the horns trade "fours." "The Vamp" is not dedicated to Theda Bara but derives its title from the suspension that is used extensively in stating the theme, and also utilized behind the soloists on this minor-key number. Morgan leads off, and then Hank shows why he has few peers when it comes to generating genuine emotional heat. The ballad of the date finds a serene Mobley in the spotlight. "I See Your Face Before Me," the evergreen by Dietz & Schwartz, has not been done that often by jazzmen. One version that comes to mind is Miles Davis's of about 1955. After Hank's tender theme statement, Lee enters muted. Then some cologned chords by Harold lead Mobley back in for a reprise. Mabern leads off the soloing on the last of Mobley's four pieces, "Ballin'," another intriguing theme, this time in flowing 3/4 with an emphasis put exactly between 2 and 3, dividing the measure in half. Lee comes sweeping in, followed by a climactic solo by Hank. All of this is strongly underlined by Ridley and Higgins. Not too much can be said in praise of Billy. No matter what the meter or the tempo is, he makes his presence a highly-creative, positive force. As for Hank Mobley, in Dippin' he has once again dipped into his bag of goodies and pulled out some plums. While adding this achievement to his growing list of successes for Blue Note, he reiterates what people who really listen have known for some time--that he is an extremely virile lyricist of the tenor saxophone, and among the very best playing that instrument today.